Kingdom Hearts has recently entered the world of downloadable content with the recent release of Kingdom Hearts HD 2.8 Final Chapter Prologue and it seems the digital train isn't stopping any time soon. 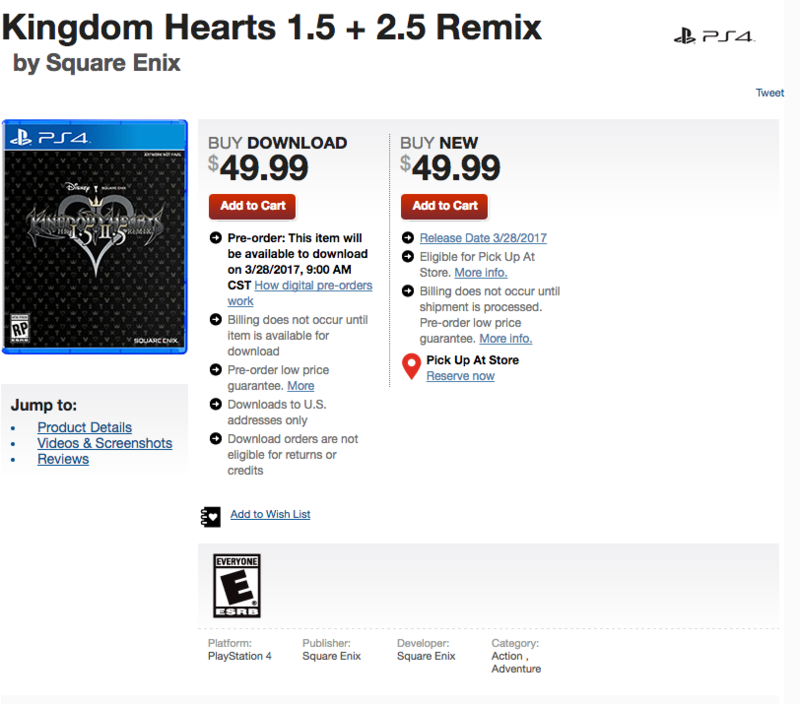 Gamestop has put up a listing for the digital version of Kingdom Hearts HD 1.5 + 2.5 ReMIX for $49.99. Thanks to DOWN from Neogaf. If we really don't get anything that compensates for the horrible cover-art and no extras at all, I might actually just pick this up digitally because why not. Apologies to those who saw the article listed as "Gamespot". It is absolutely ridiculous how close in name those two are. Still holding out on something interesting physically (a la 2.5 Collector's Edition), although after the recent string of Limited Editions would suggest otherwise. I'm hopeful in the not putting all my eggs in one basket kindof way. Didn't the PS4 FFX release have a rather subpar CE compared to the PS3 counterpart? Please Chaser tell me this will be available on the PS Store too!! I mean I know its kind of obvious but still!! Well, yeah. Gamestop sends a code that you redeem on the PSN. The PSN listing should hopefully go up sometime soon, or it will go up on March 28th if they're not taking pre-orders. Thanks again for sharing this news and making this day happier for me! Do we know if there is cross-platform trophy support? Can't wait to plat BBS again. Please don't plat re:CoM again think of the children. I don't know what children, all children. I just can't understand how anyone can do it even once but I swear. If someone plats that game twice xD It secondhand hurts me to even think about it. Also trophies not stacking means I'm probably never buying this, which is good. Saves me the money, I like my PS3 versions just fine. I had preordered in Amazon, just in case, guess it's time to cancel. All digital for me, I hate how PS4 works (install game on hdd anyway and then require disc forever). Sadly I know I'd do this again. At this point I'm the only person on here who has every single KH PSN-trophy (and proved it) and I'm not gonna lose that to anyone. I don't understand why the games (on the PS3) weren't released digitally in the first place. I mean, it's just so easy these days. Well, it's not like the PS3 games came out like...yesterday. Maybe they didn't think it was worth it really.